So ive spent the last few days going over what i could find on the internet and what few papers i have on the stuff and ran across the "super squish" pistons that Larry Widmer( "oldone" on the fourm i believe) developed. From what i researched, it seems as if it started with nascar in the 80s and 90s and spun into the air cooled vw market. Now while reading up on this i came across alot of people saying that the cam and chamber had to be just right for the pistons to work. I also ran across a few pictures of what i imagine the pistons are. My questions are as follows. 1. If cam events matter what would it be? Is the cam required to bleed of the excess compression? So static is high but dynamic in the normal range. Or is this piston making it so both can be higher? 2.are we just aiming to make the most squish area by using intake dome to force charge over to exhaust? 3.is there a noticable amount of charge that gets stuck on the other side of dome and is unburned almost like in the top ring land? Re: Piston shape and detonation. On a 4 valve engine, you need to look at what the sportbike manufacturers are doing. They're routinely selling street bikes from the factories with 12.5:1-13:1 compression for pump gas, on bores as large as 4.40" (Ducati). A lot of it is in the mixture motion in the chamber. Ducati has been students of Keith Duckworth and were noticeably ahead of the Japanese in refining this technology (obviously the Japanese finally figured it out and refined it too). The other is modern EFI and engine management systems (being able to run the engines right on the edge of detonation). Also, lots of time spent on cooling passage design and removing heat helps quite a bit. The rules do apply, lower smoother domes are always better. Squish is probably as much as you can get away with. The other is run the top ring as high as you can, safely. 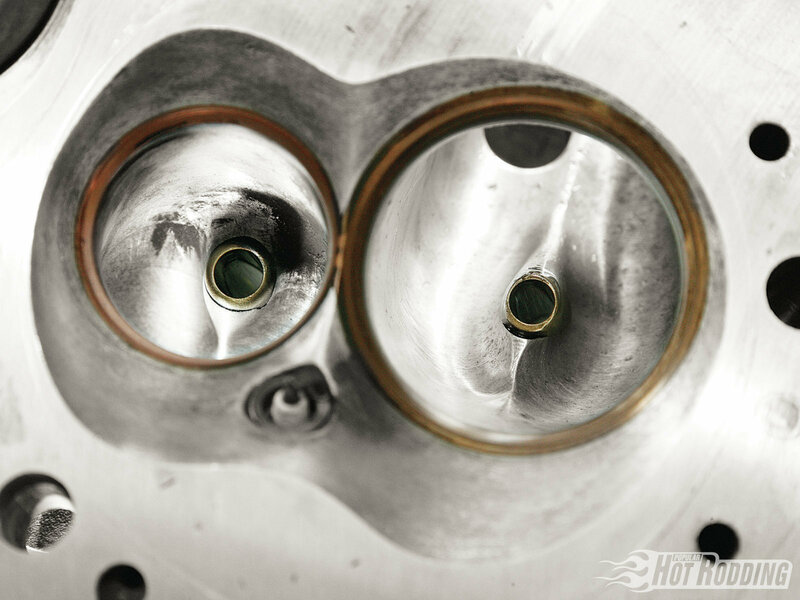 Look at a modern OEM piston design or a highly developed NA race engine (NASCAR). Very little crevice volume. I think another good example would be the NASCAR engines, for 2 valve applications. They're spec'ed at 12:1 compression ratio, and the valve angle of the heads affect the shape to some degree, but no doubt they've poured tens of millions of dollars in improving the combustion efficiency. Last edited by Truckedup on Thu Dec 13, 2018 6:28 am, edited 1 time in total. Does NASCAR specify valve arrangement or combustion chamber shape? The limit compression now, think that started in 90s. Used to be run as much as you want. Last edited by Newold1 on Thu Dec 13, 2018 8:16 am, edited 1 time in total. The heads are homologated pieces, but are a blank slate circa about a decade ago. The chamber can be any shape, just that the valve included angles will dictate the shape. That said, being blank sheet designs, it’s all optimized. I think domes like that are just builders not seeing the forest (good combustion) for the trees (compression, more is better!!!). So talking about flame travel wouldnt it be better with the design of the pistons larry made? Just looking at what ive seen (which i know is not a scientific test) with the pistons and what not, it would seem you could get the best of everything with design. 2. Supposedly dense charge at spark plug. 3. Less area to expand across for a faster burn. Please tell me if im wrong or on wrong track with my thinking. Great to be back on fourm and thanks to all who got it going and especially to Dons family for keeping it going. I don't think intake charge motion is as affected by a taller dome during intake opening until closing much because the the piston and it's dome will be down substantially in the cylinder when the intake event and charge is entering the cylinder via the chamber and valve opening. There is no appreciable squish occuring at this point as that takes place when the intake has already closed and the piston and dome are up near TDC. The secret seems to be that the actual squish generation and motion imparted to the fuel charge can be restricted and affected by a major dome obstruction that is then in the chamber. I think this is what Larry was talking about with his years of DOHC 4 valve piston dome size and shape as well as chamber size and shapes iterations. I like seeing engine builders take a platform and innovate/refine to unheard of levels.What are the valve angles on the Triumph's you race. Looks like it's closing in on 90° included.